What Is Painting Season for Outside of a House? What Is Painting Season for a House Exterior? Improved paint technology lets you push down as low as 35 F (as long as you buy a certain type of paint). In Northern states, stop around November. In Southern states, stop around December. Surprisingly, fall can be the best season to paint because the difference between highs and lows is less than in other seasons. 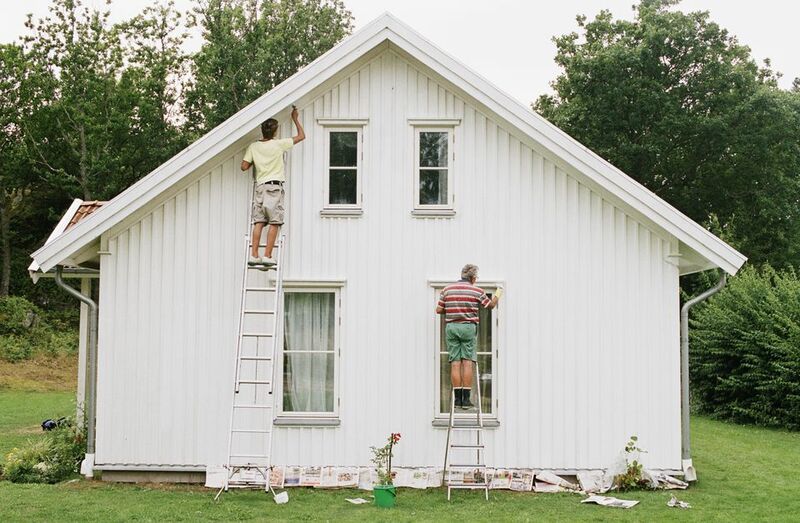 Optimal painting season for house exteriors is usually thought of as summer. The weather is warm, rain scarce, and it is a weary task made less grinding by the inclusion of sun and warmth–not to mention those steaks on the barbecue at the end of the day. If you cannot paint during that perfect season, when can you, and how far can you stretch the painting season? Paint manufacturers recommend a minimum outside temperature for painting. As paint quality has improved over the years, so too has the minimum temperature point. For a long time, it was recommended that you never paint a house when the ambient temperature is 50 F.
Today, this tends to hover around 40 F, but some premium paints can be applied down to as low as 35 F. As long as you stay above that minimum temperature, you should be fine. Just as important are the difference between temperature highs and lows–the fluctuations. Paint is not happy when temperatures during the day are 105 F and then suddenly drop down to 43 F in the evening and night. For that reason, early fall may be a good time of the year in your location to paint. Daytime and nighttime temperatures are often closer than during other times of the year. New York, NY Average low temperatures are 47 F in October and 38 F in November. In New York, November is the cut-off month for exterior painting season, at least based on averages. Columbia, SC You can push your painting season one more month. Average lows in November are 45 F. It isn&apos;t until December that averages drop down to 39 F–still within the range of premium paint specs. Paint should only be applied to a dry surface. Your painting surface can become moist either by direct contact from rain or snow or by humidity in the air. After a hard rain, wait at least one full day before painting. Check the surface to be painted; does it feel wet? Even if it does not feel wet to the touch, it may be wet within, especially for porous surfaces like bare wood and masonry. Remember, moisture happens indirectly, too. Dew forming overnight or in early evenings can quite easily mess up exterior paint–even though it was a dry, balmy 70 F just six hours earlier. What happens after you punch out for the day? Some painters are like the U.S. Postal Service: "neither snow nor rain nor heat nor gloom of night" will prevent them from painting your house. If you hear a professional painter talk like that, though, you should pass on them. While pro painters are good at stretching seasons, it is just not possible to paint during all seasons. In the cold, snowy clime of Minnesota, you will not (or should not) find painters working at all during the winter. It is just too cold for the paint to cure. And if you do try, you may find that the paint flakes off. Instead, this is the time for interior painting. Pro painters in Ohio and Illinois conservatively block off the entire mid-October to end-of-March period as a hand's off period for exterior painting. They say that even the low-temperature premium paints do not make a difference. A professional in Eastern Massachusetts even backs off from exterior painting around October 1st.